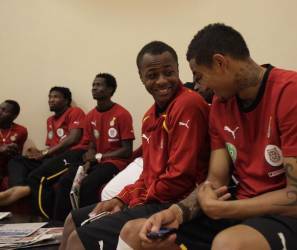 Black Stars coach Kwesi Appiah will get an increase in numbers on the training field Tuesday morning following the arrival of four more players.Andre Ayew, Kevin-Prince Boateng, Majeed Waris and goalkeeper Adam Kwarasey have all joined the national team at their hotel after touching down, Monday night in Accra from their bases abroad. The Ghana squad had their first training session on Monday afternoon at the Accra Sports Stadium as they commenced preparations for Friday’s 2014 FIFA World Cup second round qualifier against Zambia. The Black Stars are in first place and one point better than Zambia on the table ahead of their final meeting at the Baba Yara Stadium in Kumasi. Winners of the second round stage will advance to the final round where ten sides will be paired off for the final stage during October and November with the winners of the five home-and-away ties qualifying for Brazil 2014.